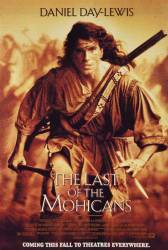 Revealing mistake: Near the very end of the movie, when Magua has taken Uncas' love interest (Madeleine Stowe's character's sister) and he is taking a path through the mountain, Daniel Day-Lewis runs up a path and brushes against what seems to be a rock. But, the grey coloured "rock" seems to be a prop and moves like a piece of cloth. Visible crew/equipment: When the people are all marched out of the fort, in the lower right hand corner there is a guy wearing a blue baseball hat. Factual error: Toward the beginning of the film, when Natty Bumppo first arrives at this friends' cabin, he mentions that he was coming from Schuylerville. This is an anachronism as Schuylerville, NY, was named after the victorious General Schuyler at the Battle of Saratoga in 1779, which would not take place until 20 years after the events of the film. The town would not assume the name for another 50 years after that. Revealing mistake: After they leave the fort, in the forest glade when the Huron start hollering, the air above the soldiers is very clear. But in the next shot just when the guns start to fire, there is a smoky haze hanging over the forest. Apparently the first attempt to film this scene didn't make it to film and some of the residual smoke was still there when they filmed it the second time. Visible crew/equipment: At the beginning of the scene, when the evicted fort dwellers are making their way through the forest, as the column moves away from the camera, a crew member with a red baseball cap and a megaphone comes into shot. Continuity mistake: When Daniel Day Lewis, his brother and father are going after the Munro girls and the officer, in one scene where the dark haired Munro girl falls against a bush and breaks the branches. If you look closely at the scene before, the branches are already broken. Other mistake: As they are leaving the fort, during the point of view shot of Cora, on the left hand side of the screen, a black gas canister can be seen. Continuity mistake: During the walk to Fort William Henry, at one point, Uncas, the true Mohican son, turns to look at Alice who is struggling and his earring is in his right ear. During the rest of the movie, the earring is in the left ear. Cora Munro: The whole world's on fire isn't it.